What did your parents give you as a high school graduation gift? Dr. Richard Settersten, PhD, the Endowed Director of Hallie E. Ford Center for Healthy Children & Families at Oregon State University posed this question at the beginning of the Schubert Center’s inaugural Kessler-Freedheim lecture. One of the most common answers to that question is luggage, which symbolizes autonomy and moving forward into adult life. However, this transition to adulthood has radically changed for today’s youth. The process of becoming an adult that emerged in the middle of the twentieth century is associated with what Settersten refers to as the “Big Five” social markers of adulthood. These markers include: 1. finishing school (which used to refer to high school, but now is associated with higher education), 2. finding a job, 3. leaving home, 4. getting married, and 5. having children. Traditionally the path from finishing school to having children occurred very quickly, but for young adults today the transition occurs much more slowly. Today’s slow transition to adulthood is affected by numerous social and cultural changes. The major driver of a long, slow transition is the pursuit of a higher education. Also, regardless of college experience, securing a full-time job that will allow independent living takes much longer than it has historically, and requires a greater range of employment experiences to get there (such as unpaid internships). Social and cultural beliefs about parenting and marriage have also changed and influenced the transition to adulthood. Past generations have viewed getting married and having children as things that made them adults, but young adults today believe that you have to be an adult before getting married and having children. Is this slower path good? 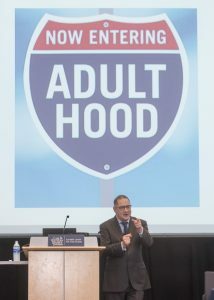 Despite negative public perceptions of this slow path to adulthood, Settersten claims that it is beneficial and more protective of youth than a fast path to adulthood. The slow path is beneficial because it allows young adults to form lasting relationships, complete higher education degrees, gain more work experience and live at home in a safe environment whereas a fast path to adulthood is risky and can lead to financial hardships and unstable housing arrangements. However, taking the slow path is also dependent on having access to the necessary opportunities and resources. The growing inequalities in our society have also led to inequalities in the transition to adulthood. Settersten noted that these inequalities are where we need to take action. Providing access to affordable higher education opportunities is important for allowing all young adults the opportunity to succeed. Also many stories of young adults in crisis are related to income inequality and a lack of resources. Better programming and research is needed to help these youth become successful adults. Settersten was joined by three community respondents who discussed current efforts in Northeast Ohio to help young adults successfully transition to adulthood. Christie Sozio, a youth engagement associate at A Place 4 Me at the YWCA of Cleveland discussed how her organization works to prevent and end youth homelessness. A Place 4 Me helps youth who are transitioning out of the child welfare system and have a high risk of homelessness make the transition successfully by providing support in the areas of employment, housing, education, physical and mental health and financial capabilities. Sozio noted that many of these young adults need adult support as they make mistakes during their transition. By connecting them to resources and permanent adult support systems these young adults can have a better chance of successfully and safely transitioning to adulthood. 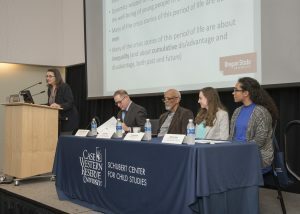 Brittany Rabb, an undergraduate student at CWRU and a youth leadership board member at A Place 4 Me, shared her own story of aging out of the system and the issues she faced when she had to quickly become an adult. Rabb stressed the need to recognize that not all youth experience the transition to adulthood in the same way and the need to provide support and resources to those who need it the most. 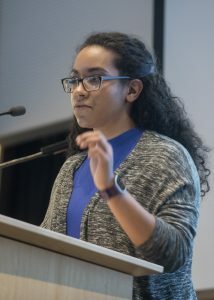 The youth leadershipboard of A Place 4 Me helps young adults with lived experiences of struggles of transitioning to adulthood to advocate for better programming. Paul Hill, Jr., the founder and President of the National Rites of Passage Institute, talked about NROPI’s mission to facilitate youth development and community building through culturally-specific rites of passage. The process promotes cultural identity, character building, and leadership development. The NROPI has focused on providing training, programming, and creating conversations about how to help African American children successfully transition to adulthood. 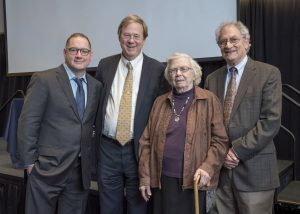 *The Kessler-Freedheim lecture is held yearly in honor of Dr. Jane Kessler, Professor of Psychology and former Director of the Mental Development Center, and Dr. Donald Freedheim, Emeritus Professor of Psychology and former Director of the Schubert Center.